Easter is a holiday that means more to me with every passing year but I don’t enjoy the thought of spending a lot of money on the commercialized aspects of the holiday. I see the cute Easter baskets for sale in the stores and think that I could just make my own, but I never have… until today. 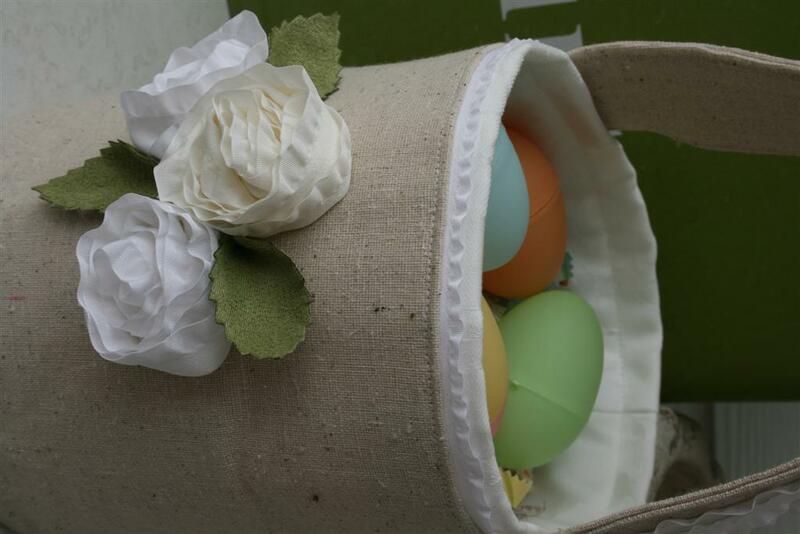 Instead of the traditional brightly colored baskets, I decided to make one in a more subdued color scheme. 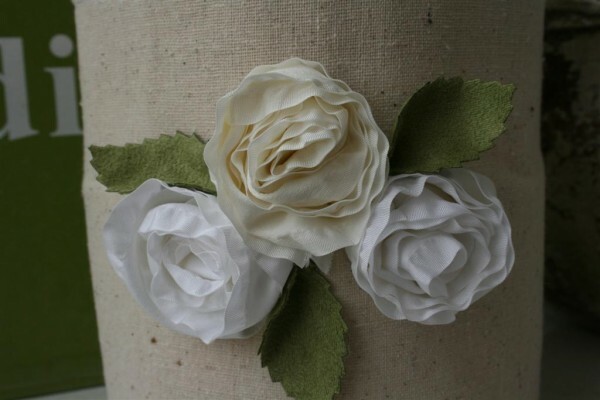 I used an unbleached cotton for the outside, white on white damask for the lining, and white and cream ribbons from May Arts to decorate it. 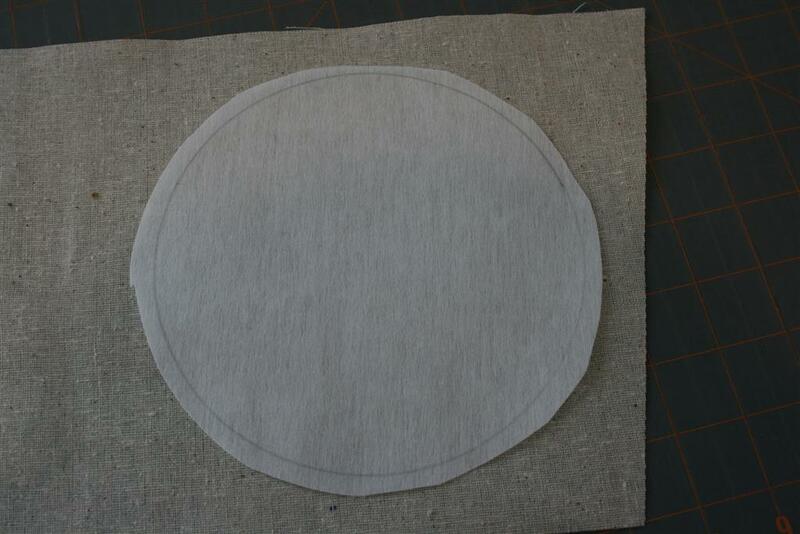 I started by tracing a circle onto a piece of interfacing to give the basket stability. 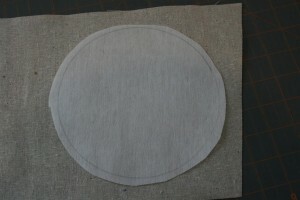 I then ironed it onto the back of my fabric and cut the circle out. To determine the circumference of the circle, multiple the diameter by pi. I then added 1/4 inch for a seam allowance, and cut the piece for the side of my basket. 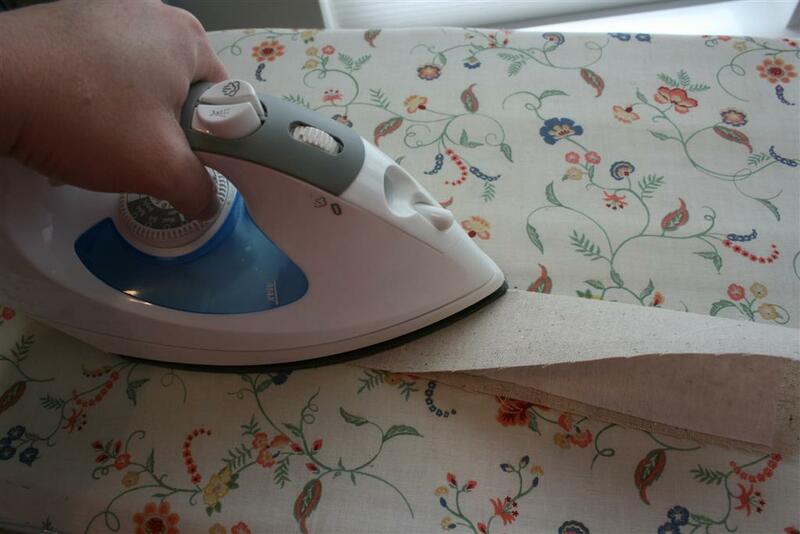 I ironed some interfacing onto the wrong side of this piece as well. Folding it in half (right sides together or RST) I stitched it into a circle. Next I carefully pinned the sides and base together, again with RST. 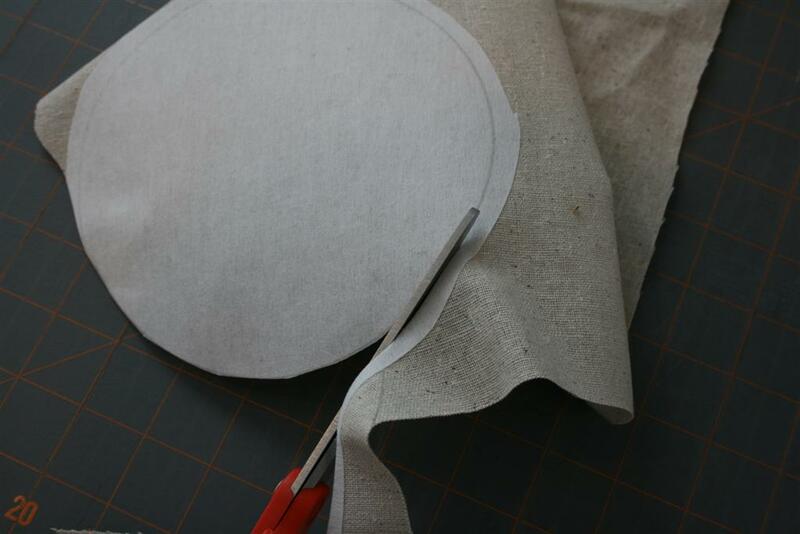 Carefully stitch around the edge of the circle. 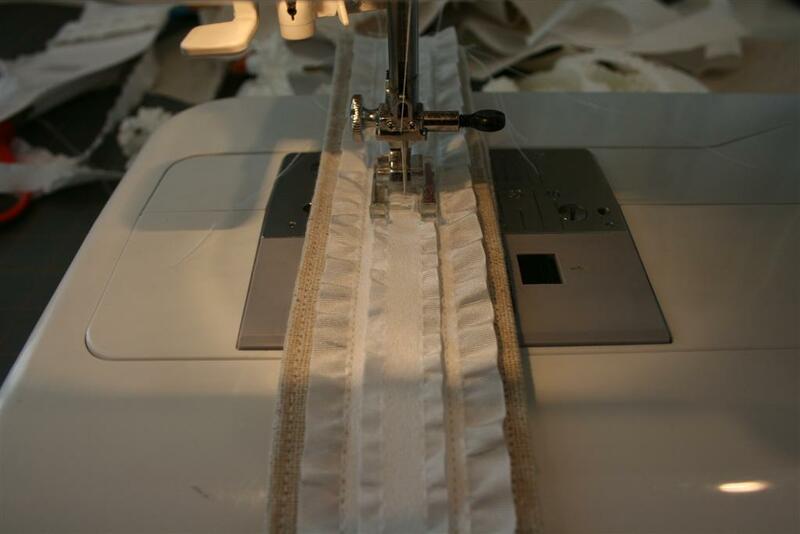 I used a 1/4 inch seam allowance and went slowly so I would maintain a good curve and be sure not to have any holes. 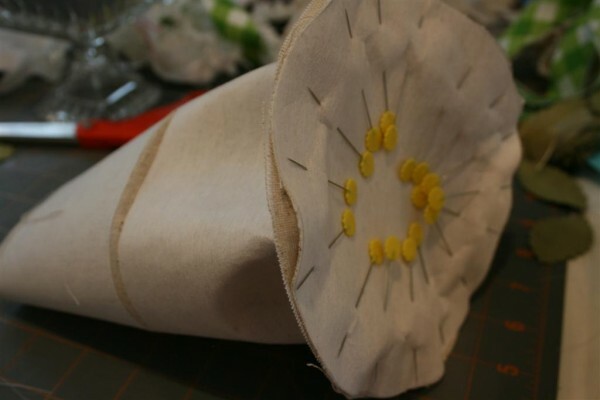 Remove the pins and turn right side out. Lining up the seams, carefully place the lining inside the basket and gently smooth it into place. 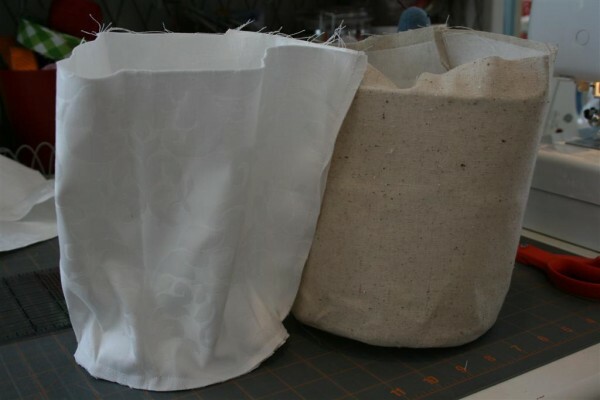 I decided that I wanted a bit of the white to show around the edges, so I folded the brown fabric down deeper than I did the white. 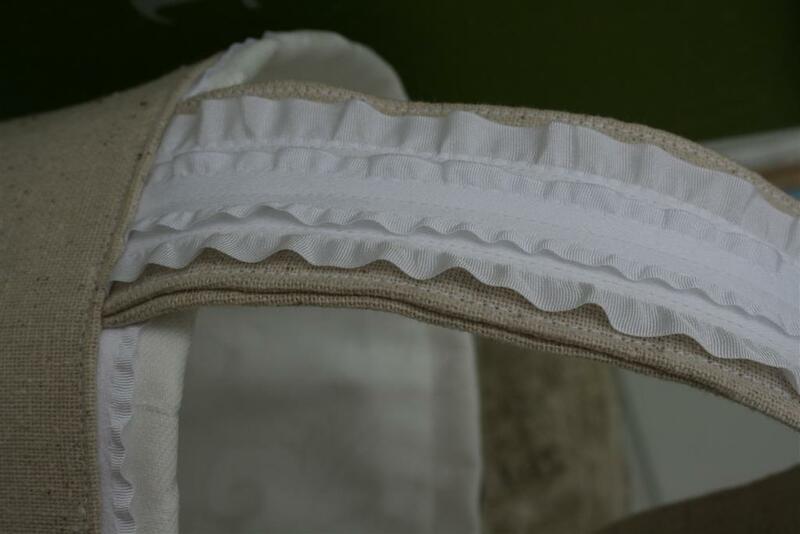 I also used a piece of 5/8 inch ruffled white ribbon in this seam so that there would be a touch of ruffle peeking out. Now for the handle. 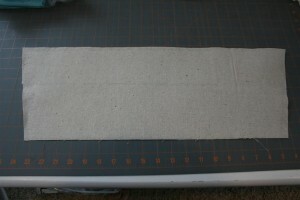 Cut a piece of fabric that is as long as you want but twice as wide as you want, plus 1/2 inch. For example, I wanted my handle to be two inches wide, so I cut my fabric 10 inches long by 4 1/2 inches wide. I then cut a piece of interfacing that was 10 inches long and only 4 inches wide. Iron the interfacing onto the wrong side of the handle fabric. 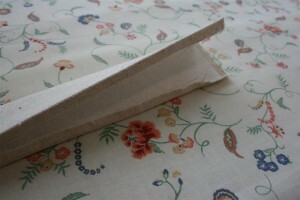 Now fold in half lengthwise and iron, then turn the raw edges under 1/4 inch and iron. 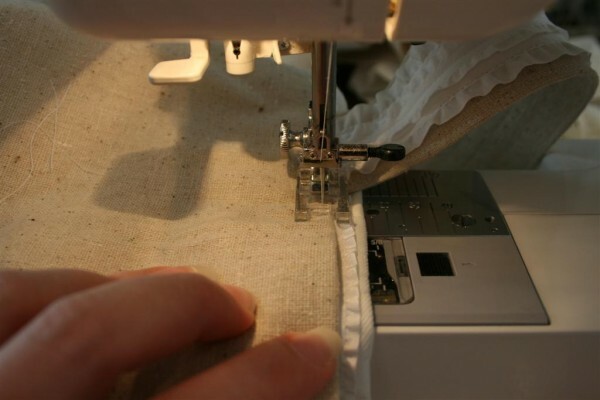 Stitch down the edge of the handle to close it. I usually stitch down both sides so the appearance is uniform. Next I used more ribbon to embellish the handle. 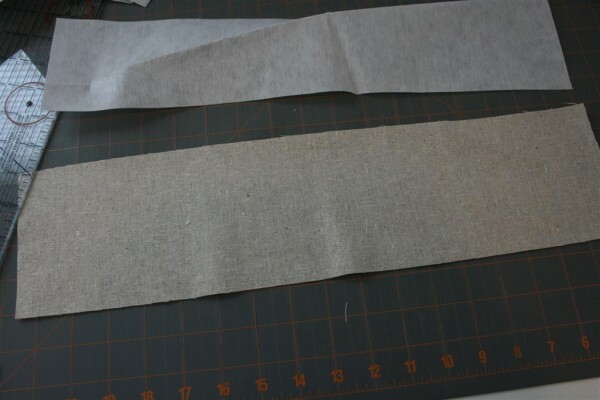 First I sewed a strip of the May Arts suede/ruffle white ribbon that is 1.5 inches wide, and then I added a strip of the same ribbon but in a 5/8 inch width on top. 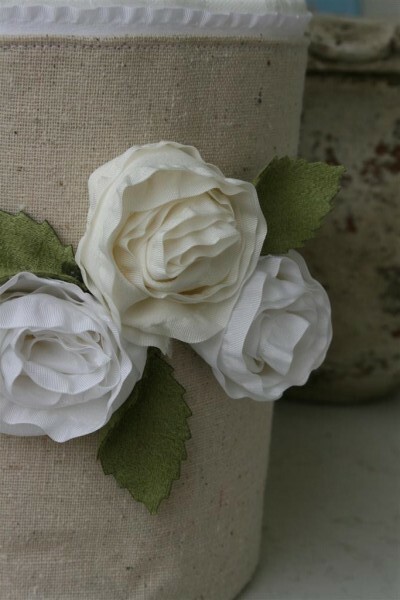 These ribbons look so pretty layered on top of one another. It reminded me of a tuxedo shirt. 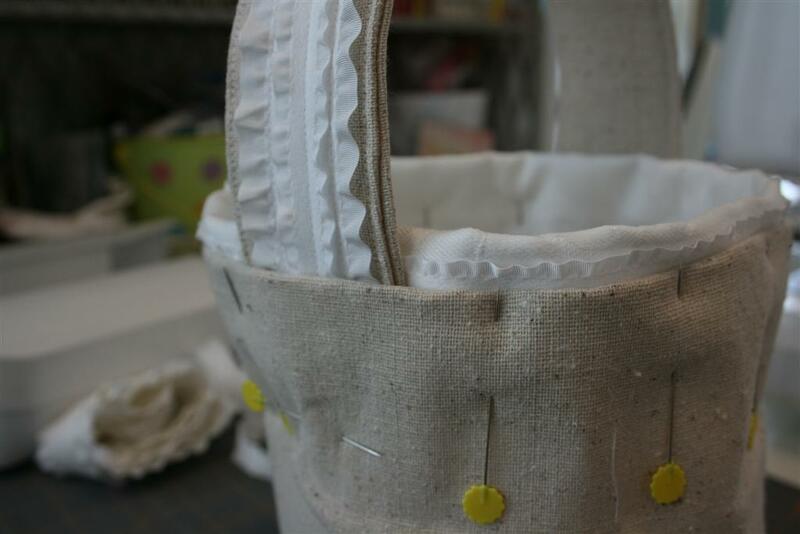 Once the handle is finished, pin it into opposite sides of the basket. 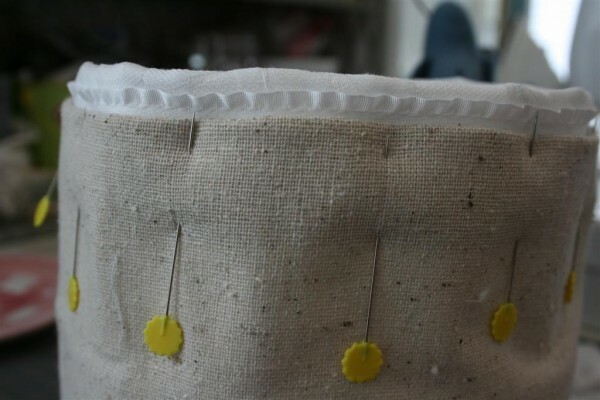 Now CAREFULLY stitch around the top rim of the basket. This seam will hold the handles in and also secure the lining. 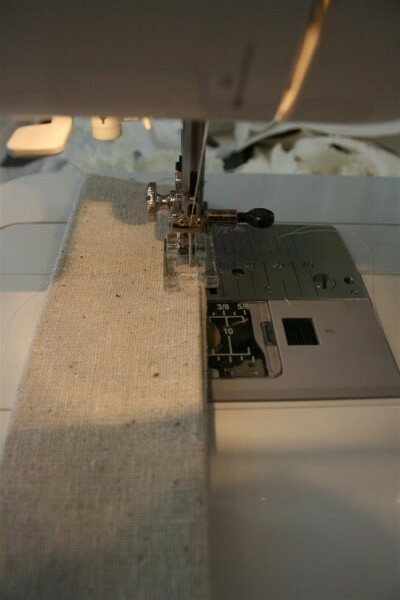 I set my machine on its slowest setting and went slowly, remembering that when I stitched through the handle my needle was going through 8 thicknesses of fabric, four layers of interfacing, and three layers of ribbon! 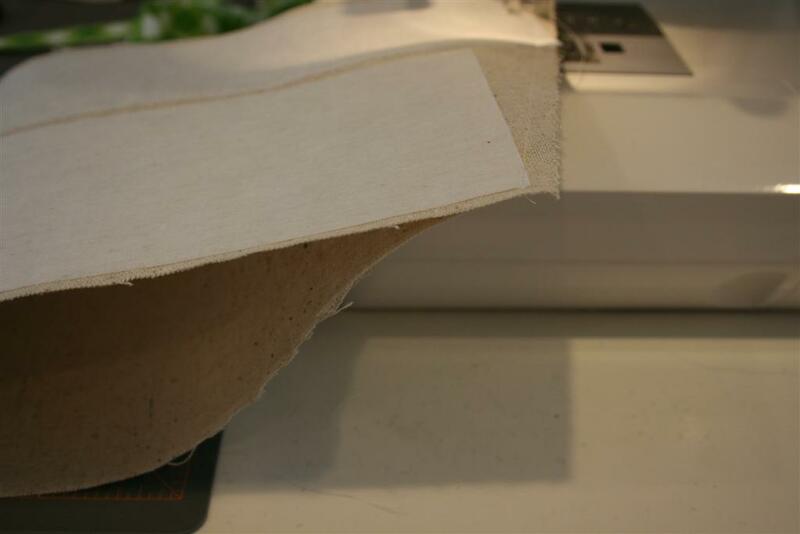 Gratefully, my machine did well and we had no broken needles! 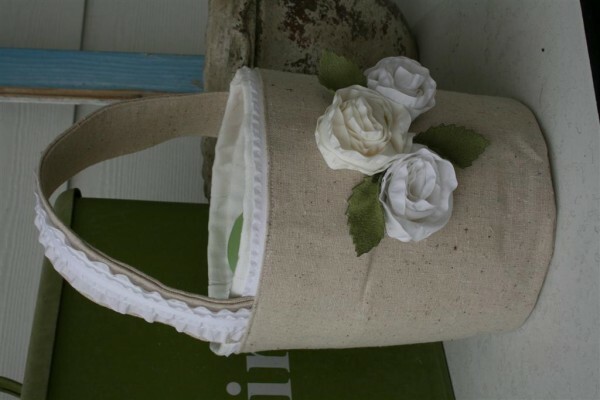 Look how pretty the handle looks once it’s all sewn together! 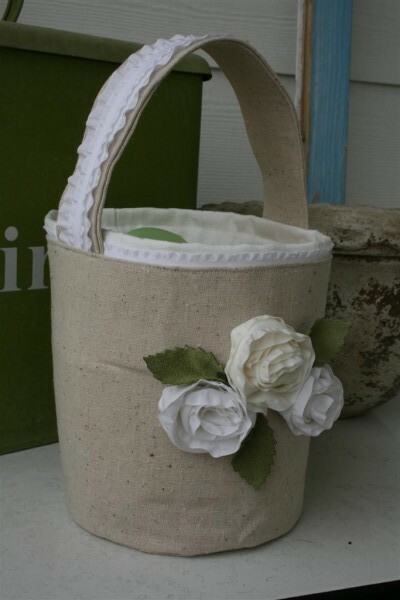 Inspired by my Ranunculus from weeks ago, I wanted to create some white flowers on the basket. 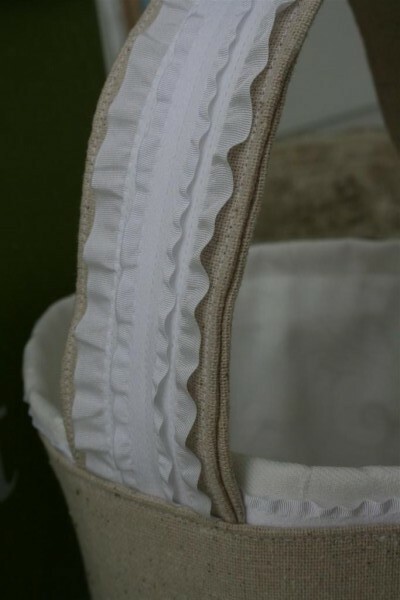 I used more of the suede/ruffle ribbon in both white and cream. With a needle and thread, I started rolling the ribbon, tucking and winding as I went with a stitch here and there to hold it in place. 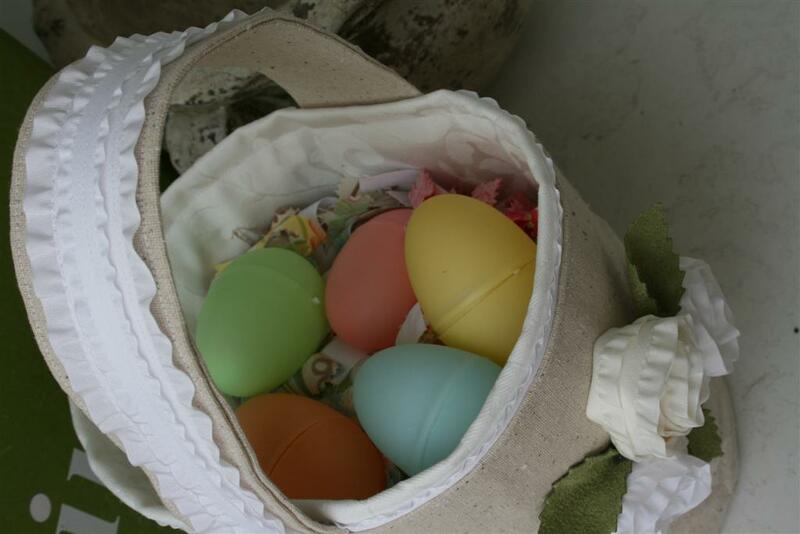 To secure them to the basket, I simply used my hot glue gun. 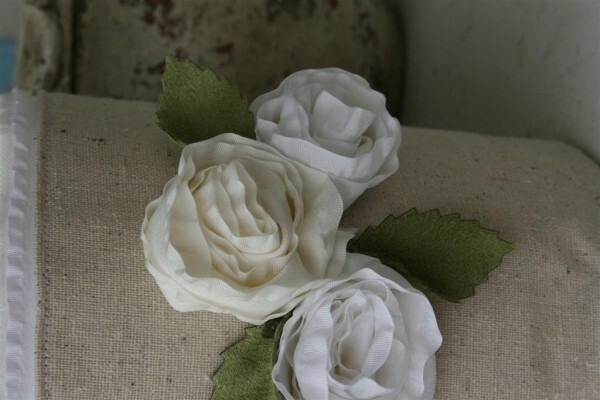 After the rosettes were in place, I cut three suede leaves (again from May Arts), pinched one end, and glued them in as well. The project wasn’t difficult or time consuming. Without a doubt, I’ll be making my own Easter baskets from now on. I’m very pleased with the understated elegance of it. 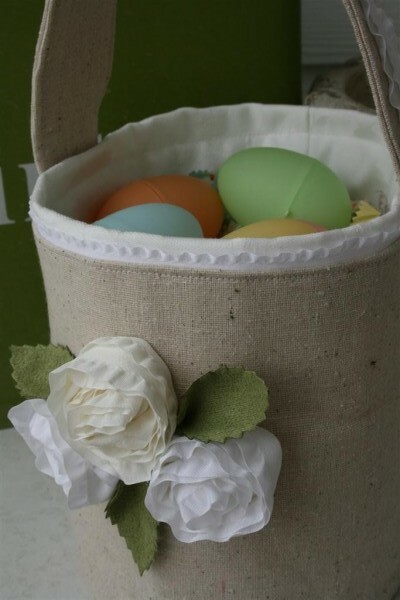 The simplicity of the color scheme and the simple flowers somehow speak “Easter” to my heart better than any Easter basket I’ve seen. I’m excited to use it! I hope you like it, and I hope you’ll try one of your own! 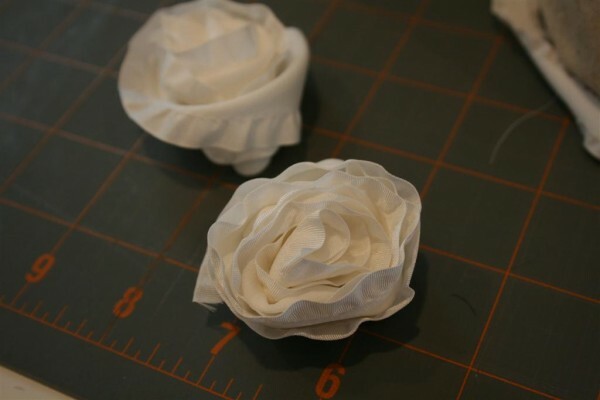 This project was created as a submission to the May Arts Spring Challenge. Thanks May Arts! DARLING! I absolutely love it. I hope to make one next year. You are so talented! Stephanie, I found the cotton at Walmart a while ago for only $2 or $3 a yard. It’s not super high-quality, but I like the texture of it quite a bit. I’ve been meaning to email you, also, call me sometime and you can come choose a few of my old hankies if you want for your kitchen window! I’d love to share with you.